I am at the Vera Bradley outlet store! Sooooo exciting! An OhMyVera reader shared a great website will all of the information we have been looking for about release dates for the Summer Collections. For photos check out this link. I love the video that Vera Bradley put together for the Summer colors! You have to check it out. Plus it also give a small preview of what is still to come this summer...a few new colors of canvas bags, frill (Deco Daisy!) and it looks like maybe straw and nylon collections! New Cinch Tote on QVC is the "Todays Special Value" This tote is also only going to be available on QVC. If you are reading this post on March 23rd then we are just hours away from the Summer 2011 Vera Bradley collection being released! 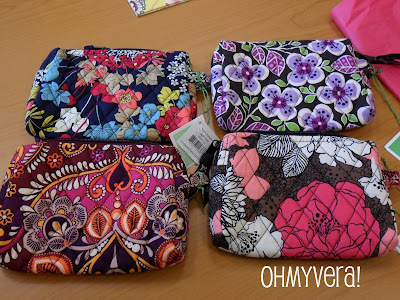 I know many of you will be watching QVC to check out Vera Bradley's new products from the comfort of your own home! Vera Bradley will also have the Today's Special Value! The first Summer promo is a special on Get Carried Away Totes! 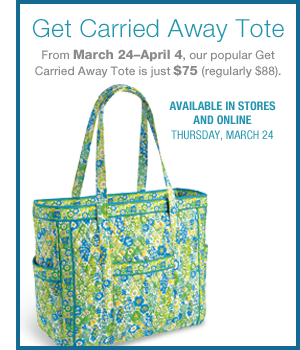 Get Carried Away Totes will be $75 (reg $88) from March 24 - April 4. This promo is going to be available online and it stores! I love my Get Carried Away Tote! 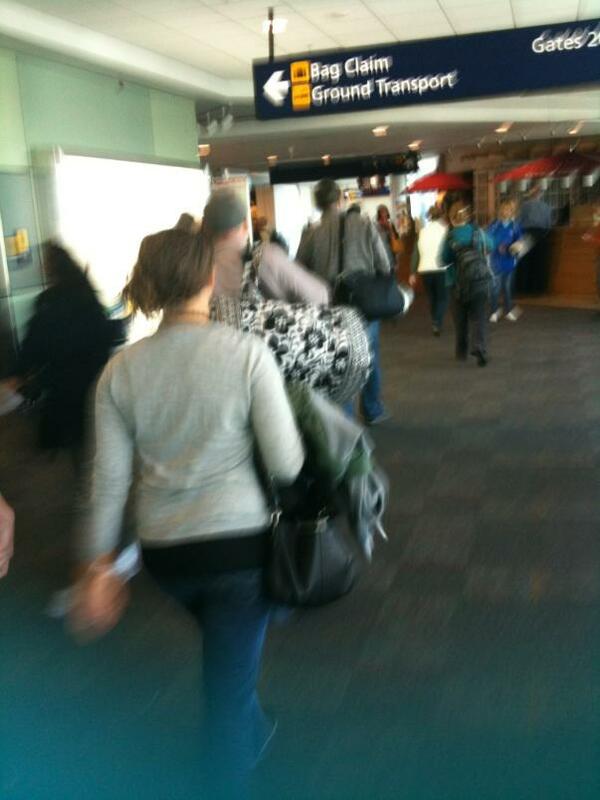 It is really large though, so it is easy to load it up with way too much stuff! Vera Bradley will once again be on QVC to release the new Summer colors! They will have two shows dedicated just to Vera Bradley and another one that will feature VB...and if you are on the west coast you get to see the colors on the 23rd, instead of waiting until the 24th!! Lucky us! Here is the description that I copied from qvc.com: A true testament to the American Dream, friends Patricia Miller and Barbara Bradley Baekgaard were traveling in March of 1982 when they came up with the idea to create feminine, fun accessories that are also practical. Within weeks, these dynamic women started selling floral cotton handbags out of their homes and named their new company Vera Bradley after Barbara's mother. Today, their idea lives on in their ever-popular brand of collectible quilted cotton handbags and accessories made from distinctive and colorful fabrics and trims that are beloved by women of all ages. 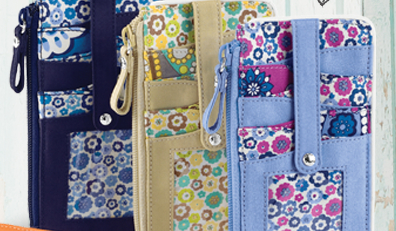 QVC® is proud to present Vera Bradley Handbags & Accessories, the name synonymous with ladylike style. Also, one of my readers was nice enough to share this picture with us all of one of the new styles! This picture was up on QVC for a little while, but was taken down. I am guessing it is part of the new patchwork collection. Very cute bags! Thanks for sharing the photo! Click here to shop the current VB collection on QVC. Imperial Toile sighting on Bethenny Ever After at Bryn's baptism. 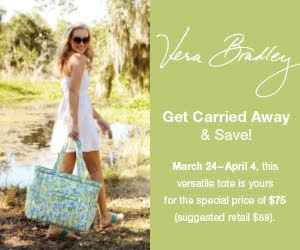 For today only Vera Bradley Totes are on sale for $29.99 (reg $46) in all sale colors. You can also get free shipping on all online orders that are over $100. I have 3 totes, they are pretty nice to have on hand. You can use them them as a purse or a tote. On St. Patricks day I used one as a purse. 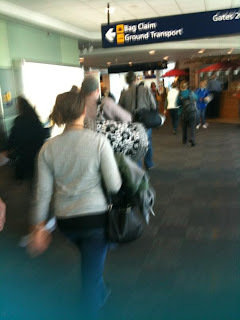 The bag in the middle of this picture is an Emily Tote, the others are Villagers. I have very exciting news to share! I have accepted a job offer from the National Multiple Sclerosis Society in Washington DC! I am going to work with all of the teams that sign up for the different events such as Walk MS, Bike MS and Challenge Walk MS. I could not be more excited about this new adventure! As many of you know I have been in San Diego. I have grown up in California so moving across the country is going to be a major change for me. Right now I am in the middle of my road trip across country! I have decided to pack up my car with as much stuff as possible and drive across the country with my friend Amber. I have never driven across the southern part of the country, so it will be neat to see new places. I am really looking forward to it! Blogging will probably be light during this transition to the east coast and I wont be able to respond to any of your comments on here or facebook, but know that I will eventually get back to regular schedule of blogging. PS. I am still looking for housing in DC or around, so if you know of anything please let me know! Sporting my Apple Green tote to celebrate St.Patricks Day! Headed to happy hour and then a street party. What are you doing today to celebrate? OhMyVera reader Tracy sent me this Imposter Sighting from T.J. Maxx. They reminded her of Bermuda Pink and Bermuda Blue. Thanks Tracy for sending this over! Click here for the link to see the bags on vb.com. March 24th is the release date for the Summer 2011 collection! That is just around the corner. 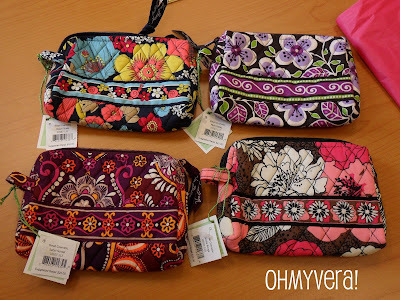 Vera Bradley has posted their official sneak peak on Inside Stitch, click here to check it out. There are even videos of each color, so make sure to check it out! I dont think that I could pick a favorite from the Summer collection, but I am looking forward to seeing them in person. The Summer 2011 Catalog is available to see online at verabradley.com. 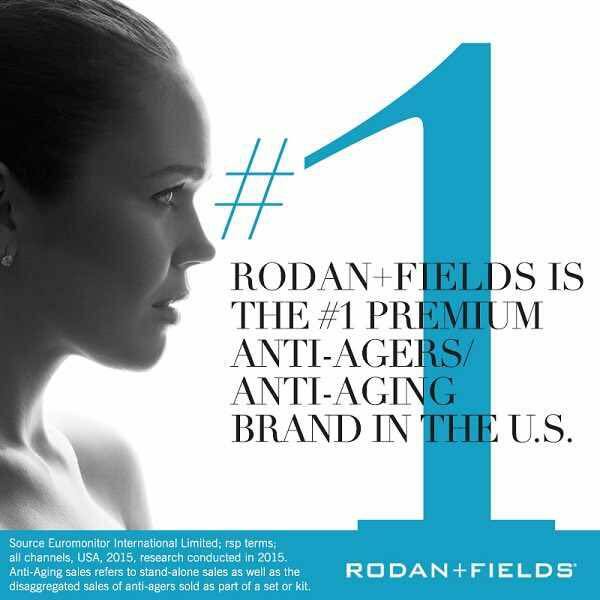 Click here to see the catalog. One of my Vera Friends shared a link to an ebay seller who was selling mixed packs of Vera Bradley cards. They were a great deal, so I decided to order a set. Much to my surprise they are Summer 2011 colors! Lucky me! It was great to see the colors in person. I still think that I like the Fall colors better. The first picture is the piles of cards and then the pictures below are the cards open so that you can see more of the print. Lisa B in all colors are on sale for $29 for today only! You can also get free shipping on orders online that are $100 or more. Last night I ventured out to the store near my work that sells Vera Bradley bags. They have a great collection of bags. They even had the Seaport Stripe bags available! 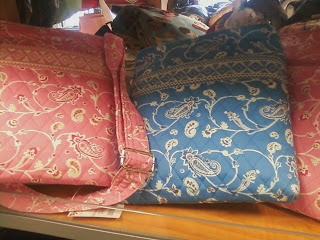 They are beautiful bags. I really like them. They are priced a little higher than the signature collection, so maybe I will wait until they go on sale. They are supposed to be released March 10th. Some of the Vera Bradley stores are currently doing a Fall 2011 color preview. The new colors for the Fall 2011 are Happy Snails, Plum Petals, Safari Sunset and Mocha Rouge. Before each season they normally do a 2 week preview at a few of their stores to test colors. If you are lucky, maybe the Signature Store near you is doing one. Fall Colors will be released on July 7th. I love the snails on Happy Snails! They are cute! And the Plum Petals is great! I have been wanting a purple bag and I really love this color! What color are you most excited about for the fall?? It is time for more colors to be added to the sale list. Purple Punch, Sittin' in a Tree and Poppy Fields are now on sale for 25% off! Also there are a few styles that will be retiring, so stock up if any of these are your favorites: Lisa B, Reversible Tote, Morgan and Maggie. I am a little partial to the Morgan. I only have one, but it was from my first visit to a Signature Store. Click here to go to vb.com and check out the new sale items. Side note: Vera Bradley sent me a Spring 2011 catalog. It is different than the one that they sent me in January, but has some of the same photos and it is just weird timing. I feel like I should be receiving the Summer 2011 catalog since the release is later this month. Maybe I will post pictures from the catalog this weekend. 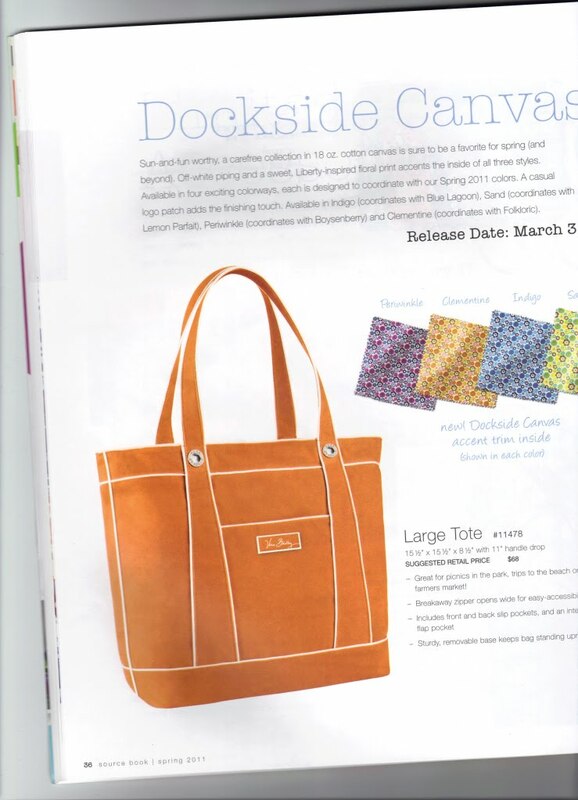 Today Vera Bradley released the Dockside Canvas collection. Head on over to verabradley.com to check it out. The collection includes a Clutch Cosmetic that is 11" x 6.5" x 1.5" and retails for $28, Small Tote that is 8.5" x 8.5" x 4.25" with a 6.75" handle drop that retails for $38 and a Large Tote that is 15.5" x 15.5" x 8.5" with a 11" handle drop that retails for $68. The Large Tote looks like it might be too big for me and the Small Tote is probably too small. I do love the white piping on these bags though. The bags come in Clementine, Indigo, Periwinkle and Sand. Happy Shopping! Just saw a homeless person walk by my window at work carrying a Peacock Miller, so of course I ran outside to snap a picture. Some of us have been waiting a while for this to be released and tomorrow is the big day! Dockside Canvas bags are being released tomorrow! The promo for this sale is the card keeper which you can pick up for $16, March 3-14. I can't wait to see the canvas bags in person. I was thinking that I really wanted one, but I think that I might just save my money. 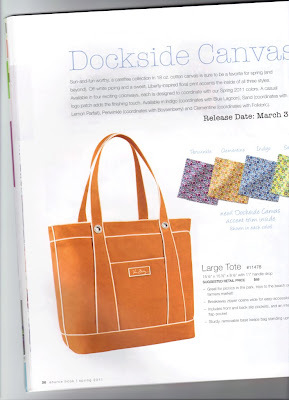 Will you be picking up anything from the Dockside Canvas collection?